Putting out two albums within a year is unique enough nowadays. Putting out two quality albums within a year is downright unheard of! 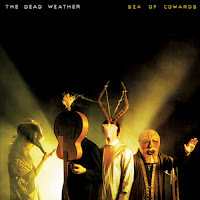 Jack White, the busiest man in music, worked hard with his band mates in The Dead Weather to be able to release Sea Of Cowards only 10 months after last year's debut smash, Horehound. Where Horehound was the sound of talented friends getting together and trying something new and creative, Sea Of Cowards is the sound of a band who has spent time playing together, writing together and gelling together to form a seamless unit bent on musical innovation. Sea Of Cowards dances back and forth between heavy riffs and spacious moments while maintaining an anticipatory edge. You'll find yourself nodding your head and holding your breath. The Dead Weather do their best to grab you by the throat and not let go for the all too short 11 song set. When I saw The Dead Weather at the beginning of this month at Third Man Records, I was struck at how well the band plays together. Jack White's unconventional drumming really sets the tone for the rhythmic identity of the band and bassist Jack Lawrence somehow locks right in while still laying down some sick lines of his own. Dean Fertita jumps back and forth between guitar and keys and keeps each song moving and powerful. I can't stress enough how well these guys exemplify an actual band. They aren't just a group of musicians who happen to be playing the same song at the same time. These guys seem to be in each other's heads and can anticipate what each other is going to do. Plus, they have a great time doing it and it totally comes across on each track. Their prowess really causes main vocalist Alison Mosshart to have to deliver on her half spoken/half sung vocal lines and her Joplinesque wails. She not only holds her own but establishes a strong presence within the band, especially in how she commands the stage at their performances. As an album, Sea Of Cowards is an amazing foray into greasy, riffy rock that will have you moving the whole time you are listening to it. The ebb and flow of each track blends into the next and on the first few listens, you may have to follow along in the liner notes to know when the songs change. The first single from the album, "Die By The Drop," is a great example of the danceable heaviness, the bombastic choruses and the trade off vocals between Alison and Jack that The Dead Weather so deftly offers up. My favorite track on the album is probably "Gasoline." The verses feature a killer bass line, the choruses are easy to sing a long with, Dean lays down a fiery guitar solo and Alison is at her howling banshee finest. Sea Of Cowards captures a band firing on every cylinder and we can only hope that they will continue in their current pace and perfection of releases. My Part-Time Cover: "When Doves Cry"